Compulsory microchipping, will it stop dangerous dogs? If they micro chipped the bad owners, banned them from ever owning another dog and banished to them to the North Pole, then I’m all for this new plan from the Government and could end this post right here. But, there’s more to it, and some so-called Human rights would get in the way a bit anyhow. So what do the government hope making micro chipping every new born puppy compulsory will solve? The good thing is that every dog will have to have an owner, who is on record as responsible for that dog. This will help track them down should their dog get into trouble or even lost. Great idea, BUT, like car insurance, those of us who drive reasonably sensibly will have it. Likewise with owning a dog and having it chipped, it’s the norm. But do they really think Joe Bloggs-Chav with his inbred Staffie are going to comply? They must know something I don’t. I think there’s a much bigger issue this micro chipping legislation box ticking, handily glosses over. What’s to be done to prevent dogs becoming dangerous in the first place? Unless you live in a country pile away from any riff raff, if you walk your dog in a public park, you’ll always be on guard for someone with an aggressive dog, out of control. Take our experience as an horrifying example. We walk our micro chipped, puppy class attended, daft as a brush Dobermann in the local council owned woods. 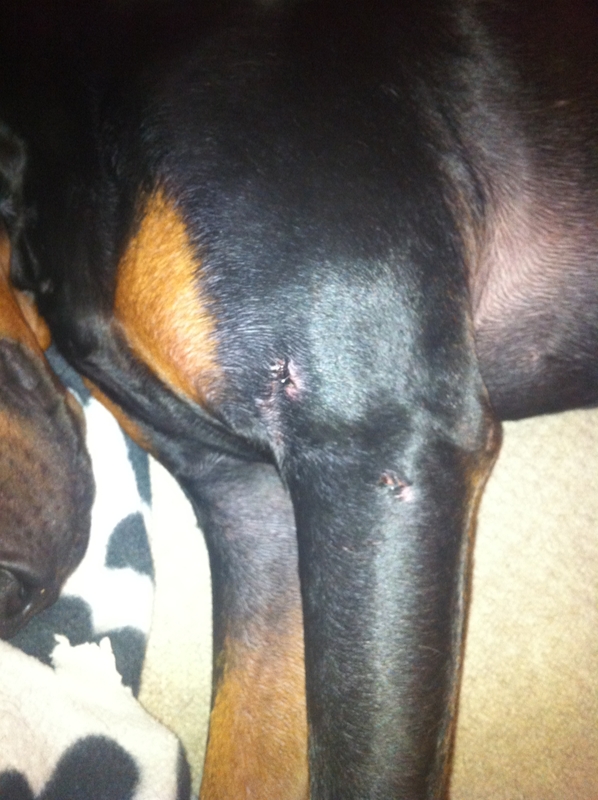 One day, across a grass clearing, a Lurcher type dog ran over 500m to our dog and attacked him, with no provocation. Lupo ended up with two puncture wounds to his front leg needing staples and over three weeks rest to heal properly. He’s now left with scars and owners who are on edge every time we see a dog we haven’t seen before. Now I don’t blame the other dog, as it was clear when his owner eventually came over and proceeded to hit his dog as punishment, the dog didn’t stand a chance of a good upbringing or training.Tell me now, how micro chipping will stop idiots like that? The truth is, responsible owners will see no problem with this. It cost £15 at our vets and frankly if you can’t afford that for the peace of mind, you are going to struggle should anything worse happen. I’d like to see more being done to quash this ridiculous ‘status dog’ culture and educate owners, with harsher punishments should they not comply. Otherwise we’ll see ourselves becoming like those in Dubai. It might be a nice place for a holiday, but dogs have to be muzzled, kept on leads at all times and are only allowed in designated areas. Do we really want that because of a few careless owners? I hope the RSPCA and Government can do more in the future to prevent this ever happening in the UK. Interesting thoughts. As you say, sometimes it’s just not the dog’s fault. I love places where I can bring my dog (a wheaten terrier) and have him off leash. It seems to get harder to find places and I worry that without unleashed dog interactions dogs will forget how to be dogs. A well trained dog should be able to go anywhere. Mine goes to restaurants, goes in very crowded public places, sails, kayaks, visits other peoples homes without jumping on them or their furniture, and has even been in an elevator without getting nervous. The more experience and interaction a dog has, the more likely they are to behave. In my biased opinion he is a pleasure to have around. Thanks for insights about chipping.